Trine 3: The Artifacts of Power has "mixed" reviews on Steam, which might come as a surprise given the near-universally positive response to the first two games in the series. The most common complaint, as Shaun explained shortly after it came out, is that it was far too short, and the move to 3D didn't go over particularly well with players either. Developer Frozenbyte posted a rather dire video a few days after that, apologizing for the misstep. The studio seems quite a bit more upbeat today, however, as it announced the launch of a content update that includes a new mini-adventure called "Quest for Cake," as well as checkpoints for Lost Pages that mean dying won't force players to restart the whole level. It also adds official SteamOS and Linux support, eliminates the "Wizard's Box" exploit that let players skip virtually ever vertical obstacle in the game by conjuring boxes while they jumped, and brings in a number of other fixes and tweaks. The Quest for Cake is estimated to be 20-30 minutes in length, "not as long as the other full levels but definitely longer than the Lost Pages," Frozenbyte said. "Our resources were limited, so we decided to make a mini-adventure that would provide a bit of gameplay for our fans." "This is a free update that we felt inclined to do for our fans," Frozenbyte CEO Lauri Hyvärinen added. 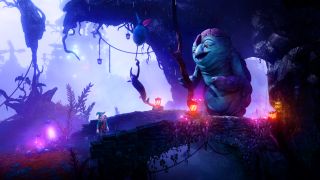 "We would love to continue with the Trine series and this is our first tentative step in that direction, hopefully the first of many." The Trine games are also on sale for the weekend on Steam, at 50 percent off for Trine 3 and 85 percent off of Trine: Enchanted Edition and Trine 2: Complete Story.